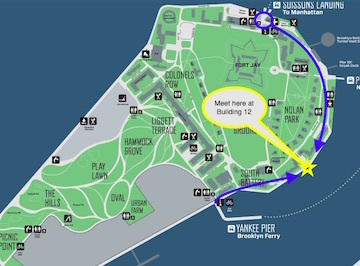 Sunk Shore is a speculative, experiential tour of the future of Governors Island. Carolyn Hall and Clarinda Mac Low lead participants along a route close to and on the south shore of Governors Island, time traveling into an extrapolation based on a deep dive into climate change data. Tours take place Sept. 8 & 23, at 1 & 4 PM, RAIN OR SHINE. Make your reservations now! The tour is approximately one hour and travels one mile to the south of the island. Sunk Shore is built to give you an embodied experience of information that can seem very remote or abstract, bringing it closer, and giving the facts weight and impact. The events of the tour are based on research about events expected to take place (and already happening), including rising sea levels, changing animal species, higher heat, ingenious solutions, possible social revolutions, and more. Devised by Carolyn Hall and Clarinda Mac Low, with contributions from Paul Benney. as part of the Works on Water/Underwater New York Residency Lab, House 5B on Nolan Park, Governors Island, NY. Participants led into the past dip toes into the Hudson River (currently the West Side Highway), then go to the 2050s enter boats to traverse the “canals of Battery Park City” (an area entirely built on landfill and soil dug up from the original World Trade Center). Paul Benney using existing structures to create the picture of the future: In the 2050s “Water Sampling Stations” are everywhere, because the natural water filtration system in the Catskills (which supplies much of New York City’s water) has eroded because of a shift in tree life. In the 2080s, the Statue of Liberty has been put on a flotation device, so it won’t flood during storm surges. Sunk Shore participants wearing the “perspecticles” (distributed by TRYST, and invented by artist Charles Goldman) that allow them to see the future. prosthetics” from Sunk Shore that help participants adjust to the future–shoes that help you adjust to newly marshy ground in the 2080s (as the former wetlands at the edges of Manhattan are restored by rising sea levels), and “fish sight” aids, that help adjust to the underwater world of 2100. 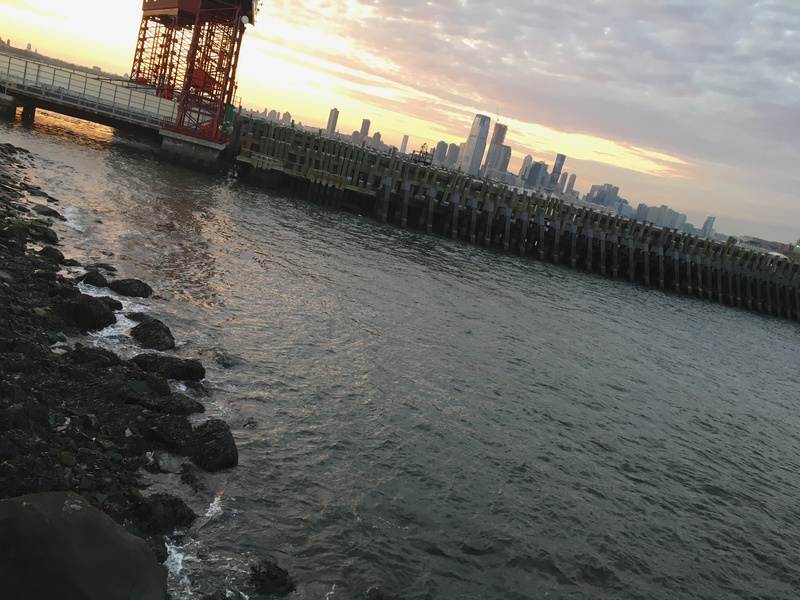 Sunk Shore was a playful speculative tour of the future of lower Manhattan. TRYST led participants along a route close to and on the Hudson River, first into the past (to establish the terrain), then into an extrapolated future, using sensory exercises, the surrounding structures, and evocative props. The events of the tour were based on current information about expected changes due to climate change. The piece was built to bring people into an embodied experience of climate change data, and bring information that can seem very remote closer, and render the facts much more concrete. The events of the tour were based on research about events expected to take place (and already happening) due to climate change, including rising sea levels and compromised drinking water. At the end of the tour, everybody was given a pamphlet that contained all the data used to create the tour.